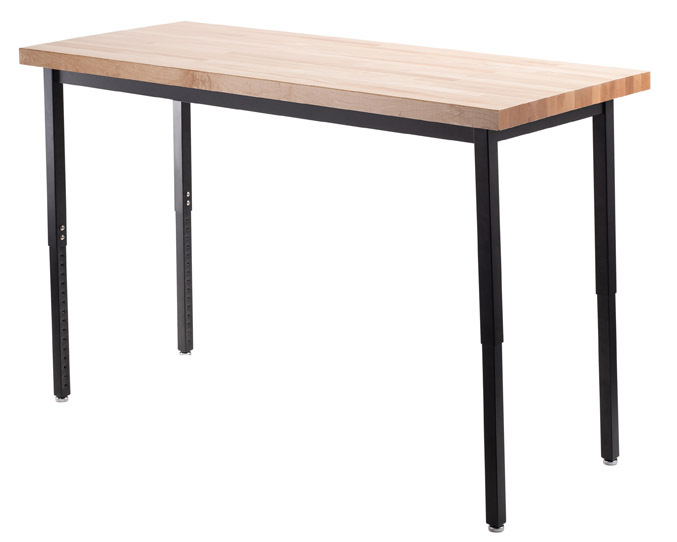 The NPS Utility Table with Butcher Block Top is the ideal working table for Makerspaces and STEM Labs. The Butcher Block top is made from 1.75” thick Maple wood coated with a urethane-based satin finish to prevent permanent stains. Maple top absorbs sound and impact, making for a safe learning environment. 16 gauge steel frame apron and 14 gauge legs make this table virtually indestructible. The legs adjust in 1” increments and are locked firmly in place with 2 K-9 external tooth lock washers and heavy duty tamper-free hex screws. All legs come standard with simple-adjust glides and have a caster option. Durable wood and hard work come together in the NPS Butcher Block Top Utility Table.